Skateboarding has a magical appeal to young boys and teens and Eoff Berend wanted to write a book that they could not put down. Although not a a skateboarder, as a San Diego County high school teacher she is surrounded by the culture and as a parent of a preteen with a skateboard ramp in her yard the culture spills into her home too. So in Vertical, she channels some of her students to find Josh’s voice and had her manuscript teen tested for authentic skate speak. Vertical’s protagonist is challenged by great literary works he reads in his English class–a language Eoff Berend is more conversant with. The author wrote this high interest novel aimed at boys but, fortunately, also enjoyed by girls. 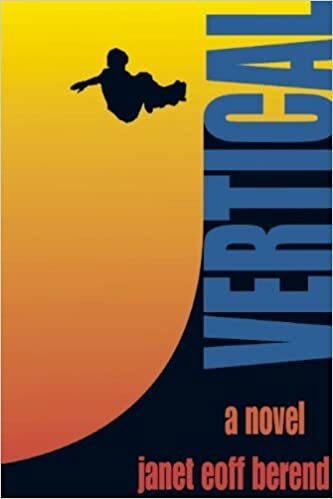 In Vertical, skateboarder Josh Lowman is faced with a gut wrenching decision, but his friendship with an unlikely bookworm and the conversations they have about literature, steer him toward a new kind of courage.Vertical is her attempt to reach readers in a meaningful way and to offer them a novel that will not only entertain them, but keep them thinking, too. Here are some of the reviews for Vertical.